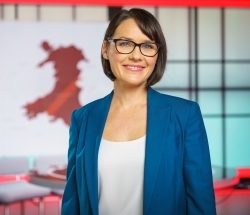 News anchor, Jennifer Jones, presents BBC Wales' flagship evening news programme, Wales Today. A Welsh speaker, she has also presented Newyddion Naw on S4C and recently narrated BBC Wales' police documentary series, 'The Crash Detectives.' She has also presented BBC Radio Wales' drive-time news programme, Good Evening Wales. A familiar face on BBC One Wales, Jen has hosted events for CBI Wales and Bafta Cymru and was delighted to present the Wales Technology Awards 2018. She has also recently presented Duke of Edinburgh Gold Awards at St James' Palace and Buckingham Palace – giving motivational speeches to young people from Wales. An Oxford graduate, Jen trained as an actor at the Royal Welsh College of Music and Drama. After a decade working as a TV, theatre and radio actor, she began her journalistic career at BBC Radio Cymru in 2009. Originally from Bangor in Gwynedd, Jennifer now lives in Cardiff with her family.